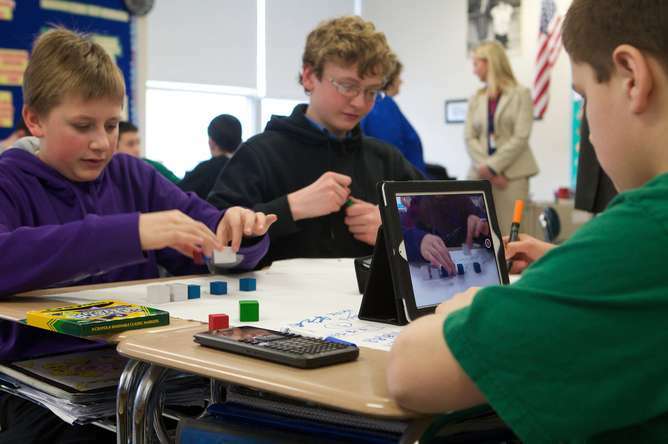 "It's OK – not everyone can do difficult math." "Students may need to hear that encountering difficulty during classwork is expected and normal," argued Lara Perez-Felkner, a coauthor of the study and assistant professor of higher education and sociology at Florida State University. "Most people believe they can do some mathematics, such as splitting a dinner bill with friends," said Samantha Nix, lead author and doctoral student at Florida State University. "But fewer believe they can do mathematics they perceive as 'difficult.'" It's almost silly if you think about it: you don't take classes to study topics you've already mastered. Yet saying "I can't do math" is often accepted with head nods from others. Saying "I can't do reading" might instead be met with looks of disbelief or encouragement to work harder on learning language skills. High school students who believed they could master the toughest math concepts were more likely to major in math-intensive fields two years after graduation. Similar results were found for students who believed "most people can learn to be good at math" – a belief psychologists call a "growth mindset." Performance on a difficult math test was used as a control. But students had "almost no probability" of correctly answering the test's problems. This fact limits how well the test can measure individual differences in math performance, since everyone was bound to bomb it. Endorsing a "growth mindset" seemed to equally benefit boys and girls, the study found. Regardless of gender, these beliefs predicted later majoring in math-intensive fields. Catherine Good, associate professor of psychology at Baruch College, told me this finding did not necessarily surprise her. She's also found benefits of growth mindset messages for both genders. Other studies suggest nuance about whether beliefs concerning hard work contribute to the low numbers of women in STEM. Professor Good, for instance, told me that messages attaching great value to hard work may particularly benefit females facing "identity threat." Such threats include taking a math test described as diagnostic of math intelligence, for example. Professors prizing innate "genius" may also discourage women more than men, cautioned Andrei Cimpian, associate professor of psychology at University of Illinois at Urbana-Champaign. "Women's personal growth mindsets – although undoubtedly beneficial – may not be sufficient to buffer them against an environment that cherishes innate talent," he told me. 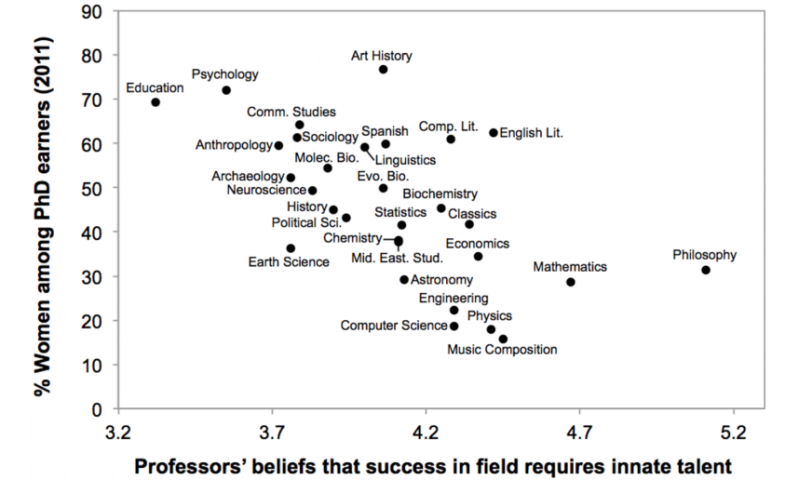 Across 30 academic fields, philosophy and math professors were the most likely to say that success in their fields depends on innate talent, according to a recent study Cimpian helped lead. Fewer women were found in fields that idolized "brilliance" over hard work. This remained true even after statistically correcting for other factors such as the math performance of graduate school applicants. "It is crucial to look not just at what's in people's heads but also at the ability beliefs that are 'in the air,'" Cimpian concluded. Teachers who believe that math intelligence is fixed can both comfort and demotivate students with messages such as "It's ok – not everyone can be good at math," for instance. Teaching this brain science to students may even help them learn. Struggling students' grades improve when they hear that intelligence can grow with hard work, according to a new study on "mindset interventions" involving 1,594 students in 13 high schools. In the study's growth mindset intervention, students spent roughly 45 minutes to read – and do two writing exercises related to – an article about the brain's ability to grow. That study's authors argue the effects were "not magic" because they depend on opportunities such as having supportive teachers and peers. Mindset interventions "encourage students to take advantage of such opportunities and may be ineffective if these opportunities are absent," the authors write. "Oh, but you can't teach those skills," teachers often say when I've discussed my research with them. Contrary to such beliefs, I found that 12 hours of spatial instruction improved students' spatial skills and grades in a challenging calculus-based physics course. In fact, a quantitative review of 217 related studies found training spatial skills was "effective, durable, and transferable." Teachers who continue to believe that "your basic intelligence can't change" – despite evidence to the contrary – may rob students of opportunities to learn and grow. Computer science and math instructors who endorse such beliefs, for instance, report being more likely to advise struggling undergraduates to drop their classes. We need to abandon dangerous ideas that some people just can't do math. Neuroscience and educational research flatly contradict such beliefs. As the new study suggests, valuing hard work over innate "genius" might even spur students to tackle new challenges.